Settling Media or clarifies are large structures occupying much valuable space on site and are perceived as high investment cost items. Attaching the very Crux of this problem, PP Aqua tech Tube Media is a PVC Tube settler which offers enhanced capacity for settling suspended solids in a fractional area. Using Munters technology, Tube Deck provides the most economical way of improving claviers performance in a variety of municipal, industrial and waste-water applications. 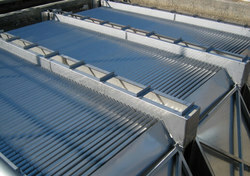 Tube media can be installed within Settling Tanks, both existing and new. We are counted amongst renowned & trusted names in offering an exclusive range of Tube Settling Media. These are fabricated by our team of experts using the high-grade material. Our offered range of Settling Media can be availed by our esteemed clients at very economical prices. We are counted amongst trusted names in offering wide range of Tube Media. 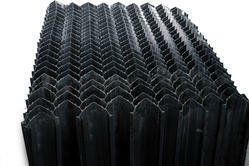 These are fabricated by our team of experts using high grade material using latest technology. Our offered range of Tube Media can be availed at very economical prices. These are widely used in various industries due to there vast features. PP Aquatech manufacture & supply of Lamella tube settler for Sludge, sand, and silts in surface water, chemical precipitation, and flocculation form solids which have to be removed. The most economical & easy process to remove this pollution is parallel plate sedimentation. PP Aquatech lamella clarifiers base on this physical principle. They consist of single profiles, which are assembled to a module forming several adjacent tubes and multiple sedimentation planes. This design increases the sedimentation area by a factor of 6 to 15 per square meter footprint. Using PPA tube settlers, therefore, minimize costs by being able to build smaller tanks very few footprint areas for that. PP Aquatech manufacture & supply of Lamella tube settler ALSO CALLED LAMELLA SEPERATOR for Sludge, sand, and silts in surface water, chemical precipitation, and flocculation form solids which have to be removed. The most economical & easy process to remove this pollution is parallel plate sedimentation.